Facebook, widely known social networking website, always try to provide something new for their users. 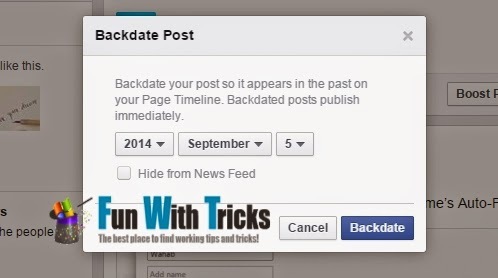 This time Facebook has launched interesting feature called "Backdate Posts". With this feature, you can schedule post to any date. Let us look on that. Compose your post and click the arrow next to the Post button. It will give you three options; schedule post, backdate post, and save draft (this too is new). Click Backdate Post and select the year first. You can post as far back as 1970 (long before Facebook was ever created or Mark Zukerberg was even born). After selecting the year, a drop-down for month appears. Selecting the month will make the day selector appear. Once you’ve set the date, you can also choose to hide the post from your timeline or not. Click ‘Backdate’. Now obviously, you might wonder what the point is of posting something on a past date and that too on Facebook where people like to know what’s new whether it’s a page posting or a friend. This feature allows pages to fill in missing events or add updates at past dates that they weren't able to. New users that like a page will be able to view them on the timeline. More importantly, it gives Facebook information about a page, business, or an event that pre-dates the network’s existence. The information is user generated and worth a lot. I wonder if we can expect a major feature to be rolled out some time later that helps us (normal profile users) put this information to better use. The Save draft feature is also new and seems pretty awesome. It’s a wonder Google Plus doesn’t have anything to match this.